It's incredible to me how, at just three months, the babies have such strong preferences when it comes to their latex bling. 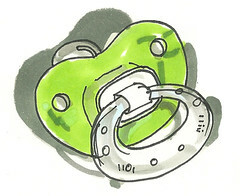 As I want to remember these tidbits in the future, tonight I decided to create a 'pacifier directory'. 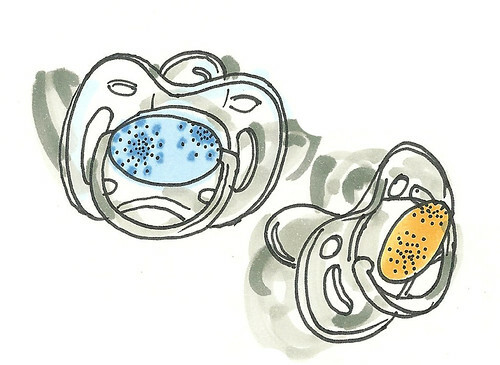 But, as is often the case when they are needed, I could only locate a half-dozen of the countless pacifiers hanging out eveeerrrrywhere in our home. These two are the best in the middle of the night when the lights are off. Unlike the others, there is no wrong way to put these in the little guys' mouths. Max's Favorite. He tends to spit this one out the least. These were given to the boys-to-be by their grandparents this past Christmas. They were presented in two tiny stockings. The yellow one has been a trusted companion from the babies first days at home, but tonight it's headed straight to trash as it looks grimy despite several attempts at sterilization. The pacifier that belongs with this clip is currently in Miles' mouth. I wouldn't dare take it out, no matter how important the drawing. Hope everyone is settling in and you're getting some sleep. Fabulous blog post. 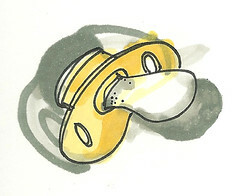 Every parent and grandparent has great pacifier stories and your boys will definitely enjoy seeing these drawings. 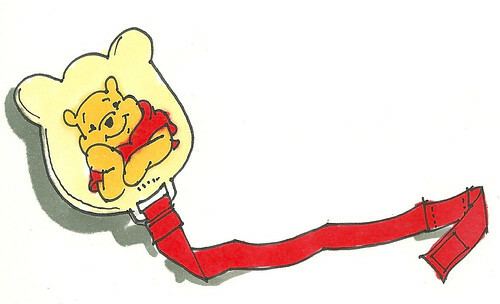 We had a Pooh clip too! So many crooks and crannies, it got scrubbed once I saw the ick on the back. Yuk! Glad you're able to think to draw again! pink paci in his month. Little brother blues:). my favorite is max's favorite! Who knew there was such a variety and such favoritism?! I didn't...LOL!...because my kids never would take one. My favorite tip: At night or nap time, just sprinkle a dozen plugs thought the crib and it increases the chances of your baby finding one if it falls out during a nap!